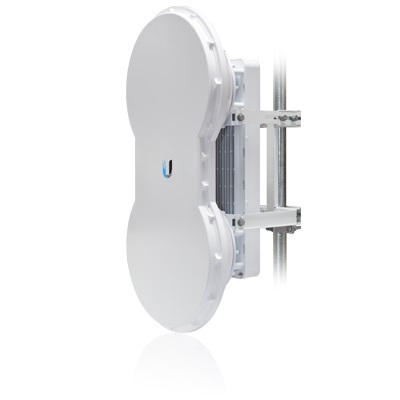 Introducing airFiber, a truly revolutionary Point-to-Point wireless platform from Ubiquiti Networks. Housed in a compact, highly efficient form factor, airFiber delivers amazing wireless gigabit+ performance, low latency, and long range. airFiber ushers in a new era in price-disruptive wireless technology ideal for carrier backhaul, building-to-building enterprise use, or public safety applications. There are two airFiber models available for the 5 GHz spectrum. The model, AF5, features the popular mid-band frequencies, which are freely used in many parts of the world. The high-band model, AF5U, which can operate in the 5.7 - 6.2 GHz bands, has robust filtering to enable co-location with devices operating in the lower 5 GHz bands while allowing operation at a higher output power in many areas of the world.